Absorbs and retains most acids, bases and unknown liquids. 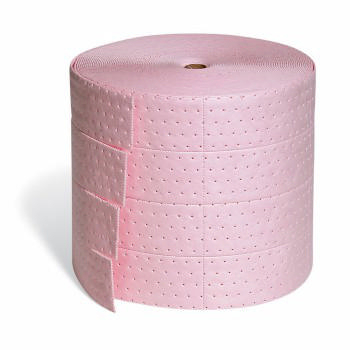 Pink color is easily distinguishable to assure workers use the correct mat during a spill emergency. Perforated every 3-3/4" across width and every 10" across length; "rip" the perfect sized mat, then "fit" it into place.